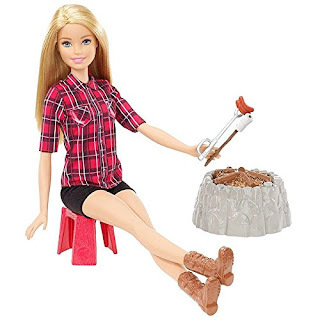 HURRY over to get this Barbie Sis Campfire Doll for ONLY $8.42 (Retail $19.99)! Go camping anytime with Barbie camping doll -- she comes with a campfire that has realistic lights and sounds. It's so much fun! Simply push the button on the campfire (it's disguised as a rock) to add sizzle to play. Barbie doll can pull up her camping stool and cook up a meal and a campfire story. A hot dog and a marshmallow, each on a stick that Barbie doll can hold, are classic camping treats that look good enough to eat. Barbie doll is ready to explore the outdoors dressed in a red plaid shirt, black shorts and brown boots. Camping lovers can tell so many tales by this crackling campfire. Collect all of the Barbie camping dolls and accessories for even more camping fun (each sold separately, subject to availability). Includes Barbie doll wearing fashion and accessories, campfire with lights and sounds feature, camping stool, hot dog on a skewer and a marshmallow on a stick.